Broccoli Salad. I know this isn’t quite something you’d think of for the middle of January, but I got it stuck in my head, and had to make it. So there’s that. 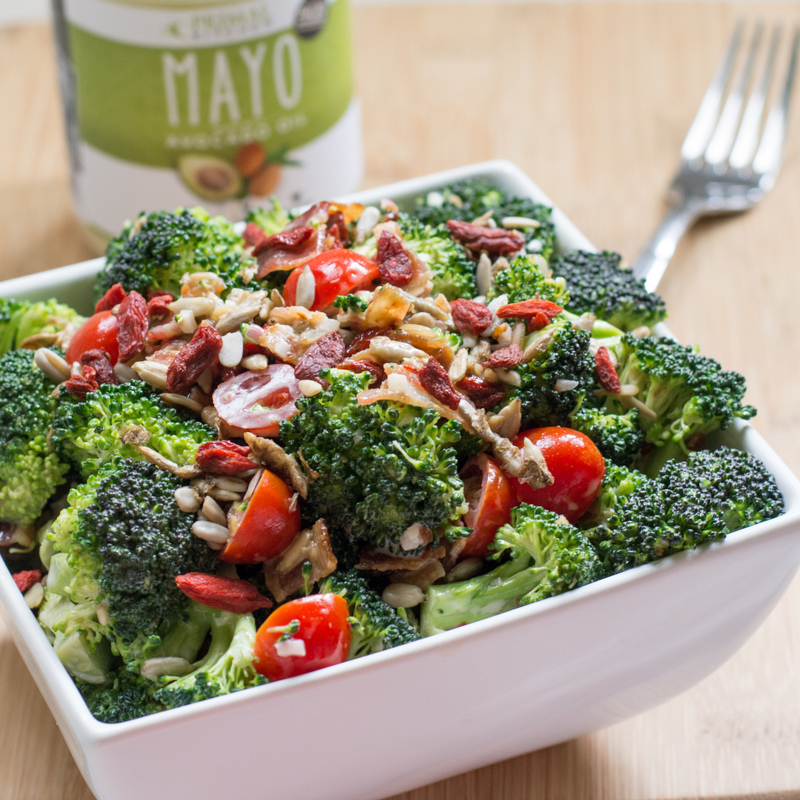 My version has a few twists in it but still reminds you of that classic Broccoli Salad that your aunt or somebody would bring over to the summer potluck! I don’t care for raisins. Like not one bit, so I subbed in organic dried goji berries and still achieved that little hint of sweetness in the dish. Raw red onions are another one of those things I just can’t do. Luckily I do like raw shallots, so that was a perfect substitution in this recipe and I opted to add it in minced in the dressing portion rather than in a dice in the salad, so it’s just a hint. I also don’t care for sugar and soybean oil filled mayos. Gross. I was lucky enough to get my hands on some new Paleo Approved Mayo by Mark Sisson‘s Primal Kitchen Foods… It’s sooo yummilicious! It’s made using avocado oil, cage free eggs, and it’s free of sugar, soy and canola! It’s amazing! Since I don’t use regular cane sugar in my daily life anymore, I surely didn’t want to add it in here for the dressing portion as many recipes call for. I very lightly sweetened it with a teaspoon of raw honey whisked into the dressing. You can definitely adjust it up or down or omit altogether especially if following the Whole30 or The 21 Day Sugar Detox like many people are this month. And lastly, I did keep in a few of the traditional ingredients such as bacon and sunflower seeds and added some grape tomatoes just for fun!! In my opinion, this version kept the main components of a broccoli salad with a few alterations that still kept it tasting true. It’s no secret that hubby doesn’t always like the same foods as me, but I’m happy to say that, once again, I was able to “fool’ him into eating my “hippy sh*t” as he sometimes refers it. I love to cook and eat seasonally, but sometimes your body just wants what it wants! So don’t wait for Spring or Summer to enjoy your favorite dishes. Make them whenever you want! I hope you enjoy this recipe and if you have any questions, please let me know! If you make this or any of my dishes, I’d love to hear your feedback! In a medium bowl, add all salad ingredients. Separately, in a small bowl, add all dressing ingredients except S&P. Whisk until combined and then season to taste with S&P. Add dressing to salad and stir to ensure all broccoli is coated.